The Canal Heritage Education Centre (known as The Mel Gray Centre after the founder of LUCS) is a superb facility for school children and other groups. It can be used as a classroom or meeting room, is 7 metres by 3.5 metres, and can seat up to 14 around a table or 30 in lecture room style. 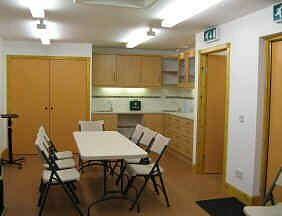 The room has central heating and basic kitchen / catering facilities, toilets and cloakroom, a digital projector, screen and Wi-Fi facilities. Facilities also include 2 toilets and an area for coat hanging. The Mel Gray Centre was funded by the Heritage Lottery Fund, West Lothian Council, the Robertson Trust, the Nancy Roberts Educational Trust and by LUCS itself. The booking charge is £12 per hour. Special rates are available to local community groups on request to the Bookings Secretary. The LUCS Booking System shows when the Mel Gray Centre is available for hire and enables you to make a booking and to pay on-line by PayPal, credit card or debit card. Alternative payment methods are payment by cheque or by prepaid LUCS Gift Voucher. In these cases the booking will be provisional until confirmed by LUCS. The Tearoom can also be hired for meetings or functions.